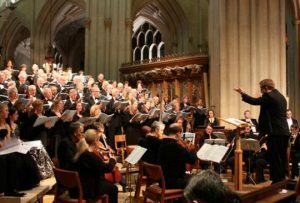 Bath Choral Society and Bristol Ensemble join forces to give their annual performances of Messiah in Bath Abbey on Friday 1st and Saturday 2nd December. Handel’s glorious oratorio tells the familiar story of Christ’s birth, death, and resurrection. The soloists are the soprano Claire Seaton, mezzo Rebecca Lodge, tenor Nick Pritchard and bass Michael Bundy. The choir will be joined by Bristol Ensemble, all under the direction of David Gostick.